Fox strives to design and manufacture high quality and durable thermal gas flow meters for industrial and emissions monitoring applications. All Fox meters use the Fox PowerPro™ sensor to measure mass flow rate and the meters are available in insertion and inline models. Fox models FT3 and FT2A are mass flow meters and temperature transmitters providing isolated 4 to 20mA and pulse output for flow rate, and a 4 to 20mA pulse output for process gas temperature or a second flow rate output. Please review the product features for Models FT3 and FT2A for further information about thermal mass flow meter products by Fox. Offering you the flexibility to monitor multiple gas types at the push of a button, rotate the housing as needed for tight installations, and configure meter settings from advanced software, the FOX Model FT4A thermal mass flow meter and temperature transmitter can be used in a large variety of Oil & Gas, Industrial, and Wastewater gas flow measurement applications. The Fox Model FT3 measures two important process variables with a single instrument, providing isolated 4 to 20 mA and pulse outputs for flow rate, and a 4 to 20 mA pulse output for process gas temperature or a second flow rate output. For over 20 years, Fox Thermal Instruments has provided a broad range of reliable, accurate, and full-featured gas flow meters to industrial control OEMs and end-user customers. The Fox management group has decades of experience in thermal flow meter design, application, and manufacturing techniques. Our outstanding team of mechanical, electronic, and software designers have helped shape the thermal mass flow measurement industry and continue to leverage new materials and technologies to improve instrument functionality, accuracy, and reliability. FOX has the flow instrumentation and expertise you need to implement a reliable, cost-effective solution to the industrial greenhouse gas (GHG) emission rule (40 CFR part 98). Every FOX flow meters' accuracy specification exceeds the requirements defined by the EPA rule, and helps provide a reliable, cost-effective solution to CO2e emissions monitoring challenges. Click here for more information. With a mass air flow meter system, costly air leaks can be identified on a system-wide scale. This is especially important when considering that leaks are frequently a significant source of lost energy, sometimes wasting up to 30% of compressor output in standard cubic feet or liters per minute of airflow. Compressed air system leaks can also cause a drop in system pressure, force equipment to cycle more frequently and lead to additional maintenance requirements and downtime. 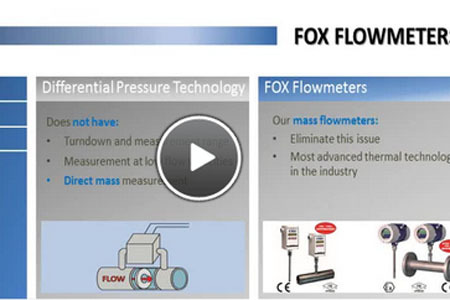 Learn how a thermal mass flowmeter from Fox Thermal Instruments can help you find inefficiencies in your process which can lead to better performance and cost savings. 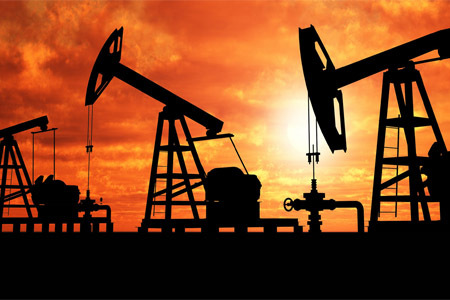 Fox Thermal Instruments manufactures highly accurate and repeatable gas flow meters for the oil and gas industry. The Model FT4X was designed for use in upstream Oil and Gas flare and vent gas applications. Accuracy is compliant with BLM 3175. Fox Thermal Instruments announced recently the launch of their new product: the Fox Model FT4X Thermal Mass Flow Meter ideal for serving the Oil & Gas and Industrial Process applications. The U.S. EPA sets national ambient air quality and greenhouse gas emission standards to ensure public health. Thermal mass flow meters deliver a direct reading of mass flow rate of natural gas and other fuel gases — without temperature and pressure compensation — and provide a simple, reliable and cost-effective method for tracking and reporting fuel consumption. A convenient and easy to follow method of finding the right flow meter technology for flare and combustor gas flow measurement.